Today may be Halloween, but 100s of kids celebrated this past Saturday at the Chicago French Market. Teaming with the Fulton River District Parent Networking Group, more than 200 people gathered for to enjoy a family-fun-filled Saturday afternoon. People came from near and far, many bringing aunts and grandparents, to enjoy pumpkin decorating with stick-on color-form faces for the younger guests and traditional carving for the older ones. Costumed children ranged from silly to scary – the most popular being princes, mermaids, dinosaurs, animals and even a number of law enforcement officers. Families mingled, enjoyed cider and cookies and admired the array of creative and fun Halloween costumes. Concentra hosted a spinning game contest, distributed helium balloons and provided families with information about their services. Following the pumpkin decorating, French Market vendors provided treats for families meandering throughout the market. Even without a holiday, the French Market is a treat, but the Pumpkin Party made the day an extra special one. All the families seemed to have a lovely time at Saturday’s event and agreed that it was a great way to start celebrating Halloween. Hot Tamale! 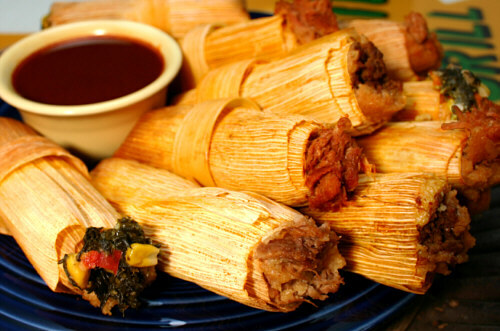 Let Prairie Fire (215 N. Clinton; 312-382-8300) warm you up this Thursday, October 20 with fall-flavored tamales being served at 5 p.m. to 9 p.m. outside (or in the bar if it rains) of the restaurant for just $5 per tamale. Praire Fire has partnered with Three Sisters Garden’s Tracey Vowell to offer guests three kinds of tamales: the Slow Braised Barbeque Grass-fed Beef Tamale, the Maple Creek Farm Guajillo Pepper Braised Pork Tamale and the Roasted Luxury Heirloom Pumpkin, Mushroom and Poblano Pepper Tamale, and will be joined by friend Chef Chris Djuric, making a special appearance at the event to help craft the tasty tamales. Three Sisters Garden supplies Prairie Fire with vegetables throughout the year and has been growing 1,500 pounds of pumpkins specifically for this event. In addition to the tamales, Prairie Fire will be serving grilled pumpkin brushed with a honey butter glaze. Pumpkin fans also will enjoy Prairie Fire’s delicious house made pumpkin. But wait, there’s more. Friend and neighbor from Chicago’s French Market, Sweet Miss Givings bakery’s famous cupcake truck will be parked in front of Prairie Fire with proceeds from cupcake sales going to the Chicago House charity providing housing and supportive services to HIV-affected patients and at-risk families. 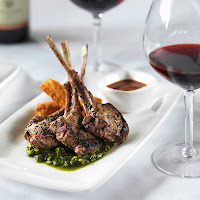 Fleming’s Prime Steakhouse & Wine Bar continues to set the standard in steakhouse dining with its introduction of seven Small Plates to its menu this week. 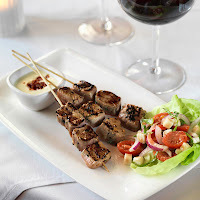 These lighter, healthier dishes represent a whole new way to dine at Fleming’s (25 E. Ohio St., Chicago; 312/ 329-9463 and 960 Milwaukee Ave., Lincolnshire, Ill.; 847/ 793-0333)– to be enjoyed anytime with a glass of wine, shared with friends, or as a starting course to a meal. They can even be an alternative to a large entrée. 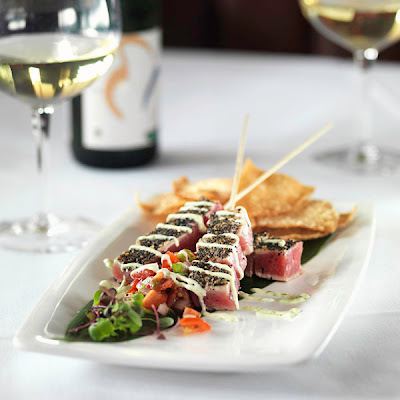 Fleming’s Small Plates are reminiscent of a Mediterranean style of dining and dishes like the Sliced Filet Mignon with Shiitake Risotto blend Asian influences with European flavors. Others like the Lobster Tempura are a variation on a Fleming’s favorite. “One of my favorites is the Lobster Tempura,” says Russell Skall, Fleming’s Executive Chef. “We took a guest favorite that was an indulgent, high-calorie appetizer, and recreated it. Skall began creating and testing Small Plate combinations nearly two years ago. What started with close to 100 original dishes was paired down to 25, then 10, and finally the best seven that join the Fleming’s menu starting on September 21. The seven new Small Plates include: Sliced Filet Mignon on shiitake risotto, chili oil, drizzled with porcini butter; Jumbo Shrimp Scampi Skewers with chimichurri dipping sauce and avocado citrus salad; New Zealand Petite Lamb Chops with pistachio-mint pesto, “F-17” sauce, and polenta fries; Ahi Tuna Skewers with wasabi aioli, sweet tomato vinaigrette, and homemade wonton chips; New Bedford Scallops with meyer lemon-honey glaze, baby carrots, green beans, and asparagus; Filet Mignon Skewers with gorgonzola-bacon fondue, mozzarella and sweet tomato salad; and Fleming’s Lobster Tempura with soy-ginger dipping sauce, arugula, jicama and apple salad. Fleming’s Small Plates range in price from $15.50 – $22.95. As with the majority of Fleming’s menu, they can be modified to be gluten free upon request. Guests also will find a contemporary new look and feel to Fleming’s menu designed to be lighter and easier to read and including original artwork from noted artist Thomas Arvid. Also debuting this week is Fleming’s newest “5 6 7” bar menu with five wines from the new Fleming’s 100, Widmer Brothers Hefeweizen (available 2 for $6), and the Stiletto – a 99-Calorie cocktail in honor of Breast Cancer Awareness Month. Guanajuato is the brainchild of chef/owner Margarita Challenger, who is a native of Dolores, Guanajuato, Mexico. Since she opened the restaurant in 2010 she has been wowing the Chicago North Shore crowd with her deliciously authentic, freshly made Mexican cuisine. The atmosphere is decidedly friendly and beautiful, and the tequila bar, with more than 40 tequilas to choose from, is becoming a North Shore legend in its own time. The Earl of Sandwich apparently never traveled to Mexico, for if he had, he would have had an even better idea: take colorful, delicious, and perfectly herbed and spiced vegetables, cheeses and meats, fish and seafood and tuck them neatly into a freshly baked corn tortilla. Fortunately someone else got the idea and thus we celebrate National Taco Day on October 4. 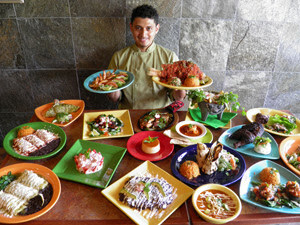 At Guanajuato Mexican Grill and Tequila Bar (73 Green Bay Road; 847-242-0501), this is a special day. To celebrate National Taco Day, Guanajuato presents a special assortment of unique, surprisingly good taco creations that are sure to be a hit. If you’re looking for an authentic Mexican taco recipe, you can’t miss with her specialty: the Barbacoa (Goat) Taco Dinner, three tortillas filled with slowly cooked, pulled apart goat meat, and garnished with onions and cilantro, and served with rice and beans ($10.95). Two excellent choices for fish lovers are the Salmon or Tilapia Tacos (Tilapia $13.95/Salmon $15.95), three tacos served with chipotle mayonnaise, pico de gallo and avocado, with rice and beans. If you’re in a seafood mood, choose the Grilled Shrimp Tacos, three grilled shrimp tacos with avocado and Pico de Gallo on flour tortillas, served with rice and beans ($15.95). 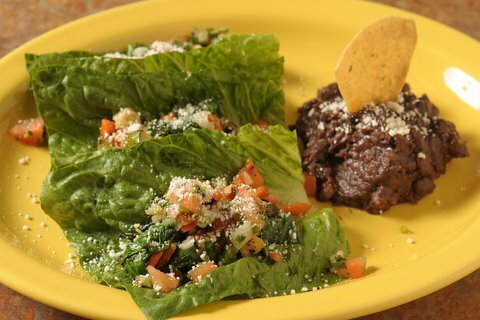 Guests who would prefer a lighter taco experience will enjoy the vegetarian Tacos Santa Fe (photo, left) in which she replaces the corn tortillas with light and sumptuous Romaine lettuce. If you’re a traditionalist, you can opt for Chef Margarita’s Three Taco Dinner, three corn tortillas filled with choice of chicken, ground beef, pork, steak or chorizo, garnished with lettuce, tomato, onions and cilantro, and served with rice and beans ($9.95). If you want a basic taco, choose the Tacos: chicken, ground beef, steak or chorizo on corn tortillas with cilantro, onions, lettuce and tomato, or the Pork Tacos, served the traditional Mexican way with cilantro and onions only. Your kids will love the tacos, too, for Chef Margarita knows what kids like: Tacos Niños, three mini tacos on either soft or crispy tortillas, served with rice, beans and your choice of chicken, steak or ground beef ($5.50). Your taco feast won’t be complete without a delicious homemade dessert. Helado Frito is a traditional Mexican favorite of fried vanilla ice cream and fresh strawberries ($6.50), or you might want to try the Flamed Bananas, warm caramelized plantains served with vanilla ice cream ($6.50). For a crispy sweet try the Sopapillas, sugar cinnamon crisps served with fresh strawberries ($6.50). Chef Margarita’s home town of Dolores Hidalgo, Guanajuato is famous for its ice cream street vendors who offer some amazingly good, offbeat flavors. Guanajuato replicates these creations in their own dessert kitchen. Try flavors such as Avocado, Cajeta, Cheese, Corn, Mole, and Tequila, or go with classic favorites such as Chocolate, Pecan, Rum, Strawberry or Vanilla ($6.75). Clay Fritz is the mild-mannered son of the founder of Fritz Underground Winery, but his passion for all things Sonoma shows every time we meet up. "Fritz is unlike any place you've ever visited. A visionary wonder built ahead of its time by namesake Jay Arthur Fritz [Clay's father] in the late 1970's, this monumental Gaudi style masterpiece represents a viticultural passion for sustainability, quality, and tradition." "Two-time James Beard award-winning chef and co-owner, Sarah Stegner, turns out inventive, high-quality food. Chef Stegner supports Green City Market and local sustainable farms. She selects the freshest seasonal ingredients to create homemade products. At Prairie Grass Café, the concept is to use fine dining cooking techniques to produce approachable, casual food. Quality ingredients are front-and-center for Chef Stegner." - Online review. Don't miss this fabulous dinner, Thursday, October 13, 6:30 p.m. at Prairie Grass Cafe. $80 per person, tax and tip included, with a special menu. Six wines, four courses. Call Schaefer's at 847-677-9463 to reserve seating. The restaurant's address is 601 Skokie Boulevard, Northbrook. Visit http://www.prairiegrasscafe.com/ for more information.